Russian analysts believe that relations between Russia and Turkey are facing a significant cooling following the shooting down of a Russian Su-24 jet by the Turkish air force on Nov. 24, and regret that Ankara is rejecting a strategic partnership with Russia, which promised significant benefits to Turkey. Russian President Vladimir Putin has bitterly condemned the incident in which a Russian Su-24 bomber was shot down by the Turkish air force near the Syrian-Turkish border and warned that it will have serious consequences for Russian-Turkish relations. The Russian bomber was shot down in the morning of Nov. 24 by a Turkish fighter jet. Turkey argues that the Su-24 violated the country's airspace, while Putin said that the plane was shot down over Syrian territory. The Russian president labeled Turkey's actions "a stab in the back committed by accomplices of terrorists." The two pilots ejected after being hit, though one has since been confirmed dead. Turkey, which has criticized Russia’s military campaign in Syria and has made its opposition to Syrian President Bashar al-Assad clear, said that it had merely acted to defend its own security. 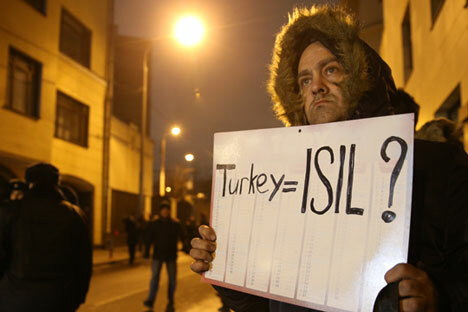 NATO, of which Turkey is a member, held an emergency meeting on Nov. 24 to address the issue. Russian-Turkish ties have been in focus over the last few months, mainly in the context of Moscow's decision to abandon the South Stream pipeline, which was supposed to deliver gas to central Europe via the Black Sea and the Balkans. In December last year, the Russian leadership announced the shelving of the initiative and the beginning of the negotiations with Turkey on the construction of a new gas pipeline –Turkish Stream, which also was to pass beneath the Black Sea to Europe via a distribution hub in Turkey. The negotiations on this project have stalled due to disagreements between the parties about the price of gas. According to Vladimir Avatkov, a lecturer at the Moscow State Institute of International Relations specializing in the study of Turkey, the downing of the Russian jet has now made it difficult to talk about the possibility of progress in the negotiations on Turkish Stream, and the incident is primarily indicative of a lack of strategic vision among Turkish politicians. "Ankara does not understand that such a strategic project as Turkish Stream would allow Turkey to control Europe through the gas valve and would give completely different opportunities to Turkey," Avatkov told RBTH. Instead, Turkey has opted for some small tactical gains. According to Avatkov, the Russian aircraft was shot down shortly after Russia had begun to actively destroy the tankers and refineries controlled by Islamic State (ISIS) extremists. This, he claims, could have damaged the interests of some in the Turkish establishment who allegedly received dividends from the oil trade with ISIS. Avatkov believes that the incident demonstrates the impossibility for the Russian Federation of building “normal cooperation with Turkey in the field of security and geopolitics” and anticipates a strong reaction from Moscow. Yet following Putin’s recent appearance at the G20 summit in Antalya and his meeting with Turkish President Recep Tayyip Erdogan there, there was an impression that Russia and Turkey had all chances to settle their differences. Erdogan was scheduled to visit Moscow in December, but this visit is now unlikely to take place, especially in the light of Russian Foreign Minister Sergei Lavrov’s abrupt cancelation of his own visit to Istanbul on Nov. 25 in response to the incident with the Su-24. However, Russian analysts do not believe that what happened with the Russian plane will lead to the complete severance of Russian-Turkish relations. According to Vladimir Sotnikov from the Institute of Oriental Studies at the Russian Academy of Sciences, the incident will certainly "strain relations between Moscow and Ankara for a while," but is unlikely to lead to a complete rupture. "There will be serious complications, there will be protests by the Russian authorities in the short term," he said. However, he does not expect the severance of mutual relations and does not believe that projects in the economic field will fall prey to this incident. Boris Kagarlitsky, director of the Institute of Globalization and Social Movements, told RBTH that Moscow itself was not interested in an unnecessarily harsh reaction. In his opinion, "the harshness of Moscow's response will be determined not even by relations between Russia and Turkey, but by how the Kremlin sees the future of relations between Russia and the West." In light of this, he believes that the "Russian authorities will choose the least harsh of all the options [for response]." Yet Behlul Ozkan, an expert on international relations at Istanbul's Marmara University, believes it may not be so easy for Turkey to win the support of the West in the current situation. "Turkey has put itself into a difficult situation in the diplomatic field," he told RBTH, pointing out that Ankara had shot down a plane that was bombing jihadist groups just when the West appeared to have changed its attitude to radical groups following the attacks in Paris. "[Now] a question emerges about the links of these groups with Turkey," said Ozkan.